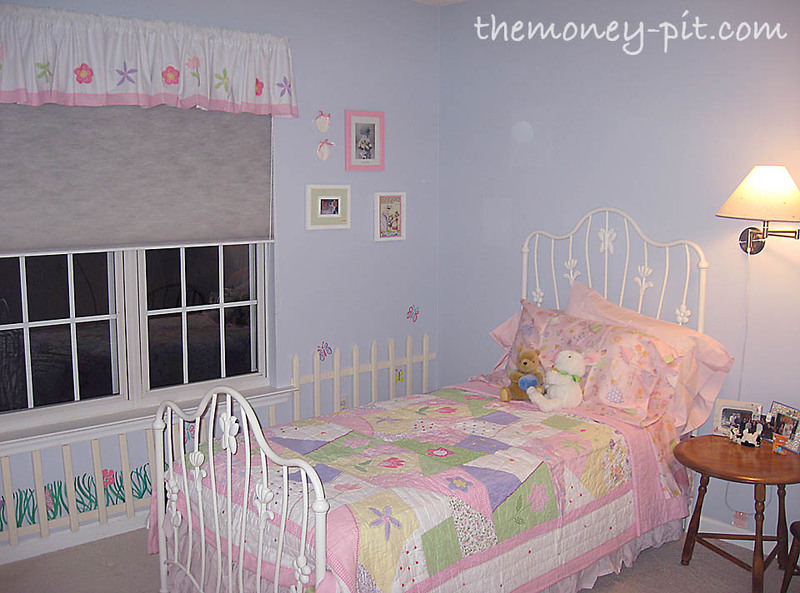 When my second daughter was born (in my 2009 pre-blogging days, before we owned the MoneyPit 1.0) we decided to convert our home office into my older daughter's bedroom. 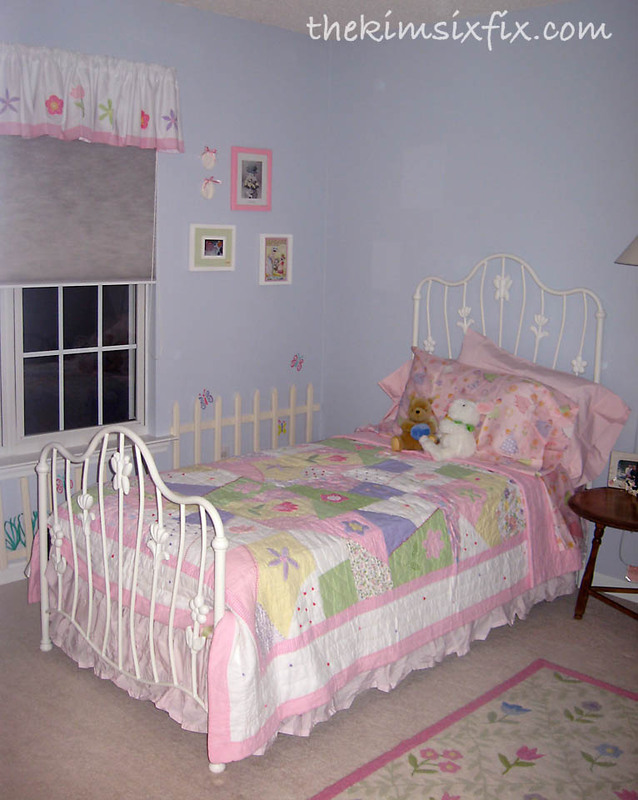 We had previously painted the room "Beacon Gray" by Benjamin Moore and didn't want to paint again. 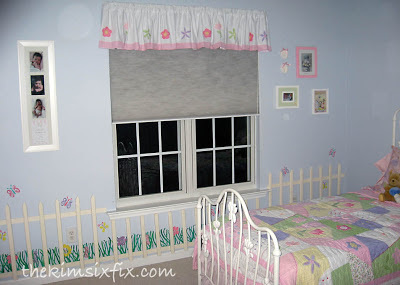 So what do you do to turn a baby blue room "girly"? Make it into a flower garden. We purchased a cute butterfly and flower wrought iron bed and added a trundle underneath. Some inexpensive bedding and window treatments from Home Goods, a homemade bed skirt and a clearance Pottery Barn throw rug brought the theme together. Then I painted and added 1 inch wide trim boards to the wall with small nails. Because I wanted to make this easily removable and not leave much wall damage, I hot glued the fence pickets onto the trim boards. The fence pickets were actually just survey stakes I primed and painted. 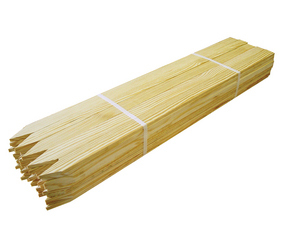 You can get dozens of stakes for less than $10 which is a great deal vs. cutting points on each one yourself. A quick and easy fix to the blue paint dilemma. Please excuse the photo quality and lack and step by step pictures. This post is a little blast from the past. My computer is currently at the genius bar getting repaired after one of my darling children tried to play a DVD unsuccessfully. So I had to drag out my old computer and as I was perusing my old photo library I stumbled upon these old pictures and thought I would share them. 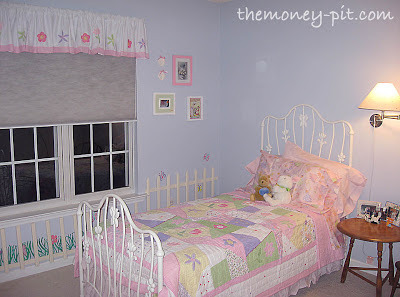 That turned into a really sweet little girl bedroom! 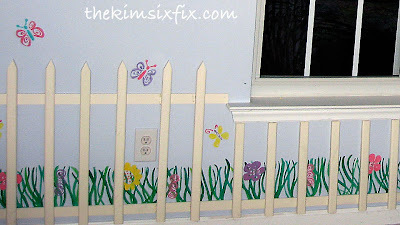 Love the garden and picket fence. Thanks for the tip on survey stakes. 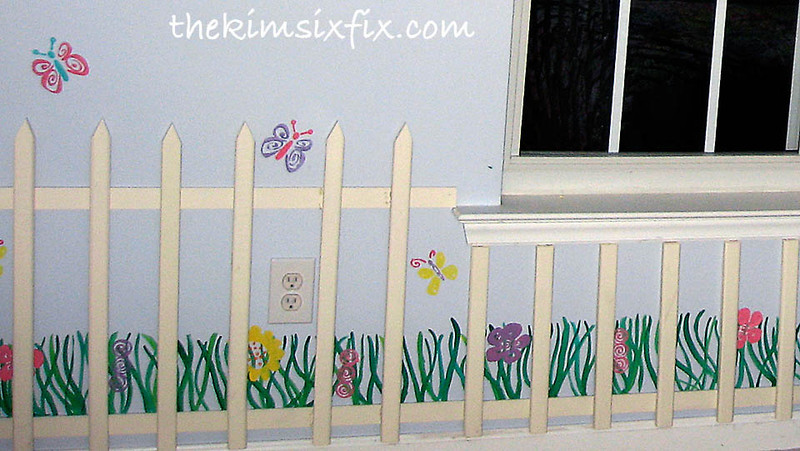 I love the idea of adding a picket fence around the room! It turned out so cute! This is so cool. I'll have to ask my little one if she wants this in her NATURE room.